If you’re longing for a Pacific Northwest adventure, look no further than Kenmore Air and its fleet of seaplanes. The pros: It’s a seaplane — it doesn’t get much cooler than that. The cons: The planes can get cramped if there’s a full load of passengers. One of the best things about living in Seattle is the array of weekend trips one can take. While many love hitting the slopes of the Cascades in the winter or splashing around the lakes around eastern Washington in the summer, my favorite trip is up to the San Juan Islands, an archipelago at the northwest tip of the continental United States. On this particular trip, I headed up to West Sound Marina (WSX) on Orcas Island, where migratory whales can be seen from April through October. Generally, people drive up to the Port of Anacortes and take a Washington State ferry over to the islands, but as I had friends driving from Seattle who could pick me up from the marina, this was the perfect opportunity to cross one item off my bucket list: flying in a seaplane. There isn’t much competition on routes from Seattle up to the San Juan Islands. 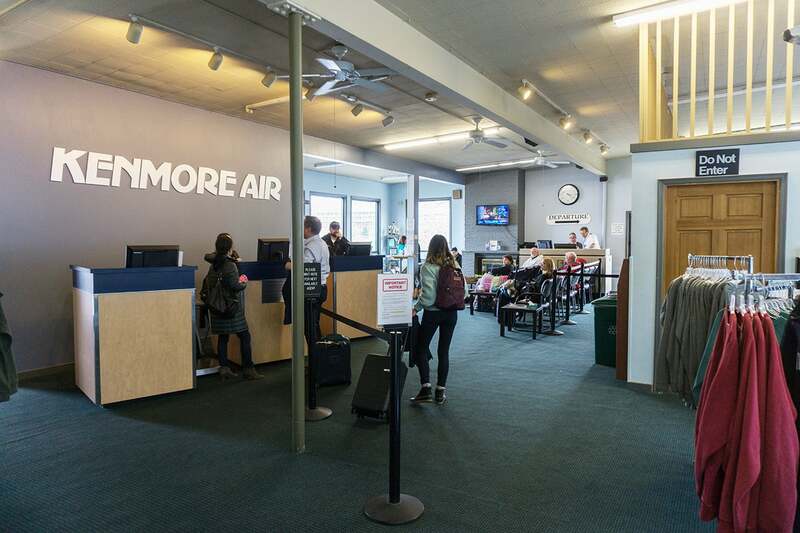 Kenmore Air is the only operator flying floatplanes from South Lake Union and Lake Washington, along with connecting service from all over the Puget Sound. It’s a small, privately held airline based in Seattle that operates a fleet of around 25 planes, flying to harder-to-reach locales in the Pacific Northwest. I booked this flight to depart from South Lake Union, right in downtown Seattle, to West Sound Marina directly through Kenmore Air’s website using my Platinum Card® from American Express, which earned me 5x points. The flight cost $159 flat, so I ended up earning 795 Membership Rewards points — worth about $15. Kenmore Air doesn’t offer online check-in, so we arrived at Kenmore Air Harbor Seaplane Base (LKE) at about 3:20pm, shortly before the 3:30pm cutoff for the 4:00pm flight. (Note that the similarly named Kenmore Air Harbor seaplane base, IATA code KEH, is on Lake Washington, about 30 minutes north of Seattle.) The check-in area consisted of two agents behind the desk, which was enough for the short line, and there was a cool gift shop with T-shirts and other swag that AvGeeks would enjoy. We handed over our IDs, our bags were weighed, and we were quickly checked in for our flight. The agent handed over our reusable boarding pass before we headed to the sitting area. The outdoor deck area of the lounge offered beautiful views of seaplanes coming in and out of the harbor. About 10 minutes before the scheduled departure time, our flight was ready for boarding. As we walked down the docks, our de Havilland Canada DHC-3 Otter shone brightly even under the Seattle cloud cover. These planes went out of production in 1967 but are still a workhorse in Kenmore Air’s fleet. It was especially interesting to see how our pilot was loading luggage into the floats of the plane. As with most civilian DHC-3s, this bird was equipped with 10 passenger seats. Seats were assigned on a first come, first served basis, and each had both window and aisle access. The seats themselves were short and offered relatively skimpy legroom, but this was only a 90-minute hop. Plus, the pilot encouraged passengers to stretch out in the aisle (with seatbelts fastened, of course). Nine out of the 10 seats were occupied on this service. The seatback pockets included earplugs, an airsickness bag, maps of the area and tourist information. There was an open doorway to the cockpit, so passengers were able to peer through and get amazing views. The definite highlight of the flight was the incredible vistas of Puget Sound. After we were cleared for takeoff, we had a short taxi and took flight to the north, though sometimes heavy winds force pilots to take off to the south. As we were ascending, we passed Gas Works Park and Aurora Bridge before heading northwest over Shilshole Bay. I spotted a few Alaska 737s making their descent into Seattle-Tacoma International Airport (SEA) a few thousand feet above us. Once we hit our cruising altitude of 6,300 feet — still well below the cloud cover — the city shrank away and disappeared into pristine Puget Sound. Below us, I was able to catch a glimpse of a ferry shuttling people on the water. We had one stop at Lopez Island, where three passengers hopped off and one more joined us to eventually head back to Seattle, which meant we got to enjoy two takeoffs and landings! Following Lopez Island, we kept a lower altitude before landing near WSX. As we disembarked on the small pier, we were greeted by security — two puppies, one with a stick in its mouth, that belonged to the desk agent manning the Kenmore Air ticket office on the island. He resembled Captain Haddock from the “The Adventures of Tintin” comics. Flying on a floatplane was a memorable experience and something I would encourage everyone with a sense of adventure to try at least once. It was as close to being a bird as us wingless humans can get in a plane — floating in the air, swishing between the clouds and seeing the earth from a seagull’s point of view. While I can’t say I am an expert on the seaplane industry, Kenmore Air offered fair prices, prompt flights and professional service in every interaction. They also provide tours around the Seattle area, for those with a hankering to try it out without a destination in mind. While the price is a little steep compared to the ferry option, the experience is best described as magical.